We come across many diverse investment opportunities through the research and analysis that we conduct on behalf of our clients seeking investments that could potentially qualify for an E-2, L-1, or EB-5 investor visa. While we often publish articles on promising franchise concepts and industries, we also believe it is our duty to also inform the public on investment opportunities we come across that we feel are fraudulent and offer false promises. Through due diligence conducted on Solar Construction LLC by the Visa Franchise research team, it is believed that Solar Construction LLC operations are questionable. They solicit immigrant investors through the E-2 Visa program to invest $150,000 to become an associate that distributes solar panels in a set territory in Florida. Known promoters of Solar Construction LLC, Robert Dubois and Raivo Riekstins, have offered distributorships of other business lines to E-2 visa investors. This includes a distributorship that was marketed as a joint venture with South Florida modular home manufacturer, SteelHomes. The following marketing information was sent to Visa Franchise by a Solar Construction LLC project promoter on February 15, 2018. Operating outside the restrictions of a franchise that is regulated by the Federal Trade Commission, Solar Construction LLC suggests future earnings to associates that have not been proven by past results. They market the investment offering at the convienient investment level of $150,000, that should be a substantial investment amount for the E-2 investor visa. 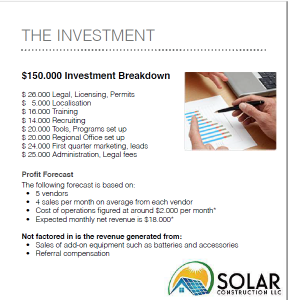 The Solar Construction, LLC investment offering has projected returns that are exceedingly high, lack of track record by the main operator, and other red flags associated with a pyramid scheme. If an investment opportunity looks too good to be true, that is likely the case. This is particularly true when it comes to investments that are aimed at taking advantage of foreign nationals looking to move to the U.S. through investment in order to qualify for an E-2, L-1, or EB-5 investor visa. When evaluating prospective investments for an investor visa, always speak to current franchisees (or distributors) to learn more about what the day-to-day entails and reasonable financial expectations. It is also recommended to only evaluate business opportunities that have 5+ established units with net positive cash flow over at least a year. When applicable, seek guidance from a qualified accountant or lawyer when reviewing financial information received during your due diligence process.